Further details on Arcade Hacker blog. See the full post on the Arcade Hacker blog. Be sure to see Part 1 and 2. Capcom’s Play System 2, also known as CPS2, was a new arcade platform introduced in 1993 and a firm call on bootlegging. 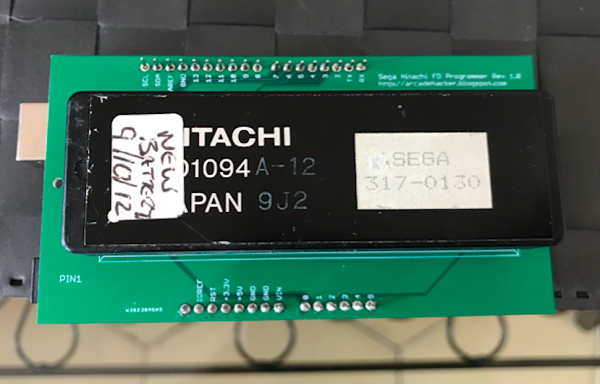 Featuring similar but improved specs to its predecessor CPS1, the system introduced a new security architecture that gave Capcom for the first time a piracy-free platform. A fact that remained true for its main commercial lifespan and that even prevented projects like Mame from gaining proper emulation of the system for years. See the full post on the Arcade Hacker blog. Be sure to see Part 1 here. 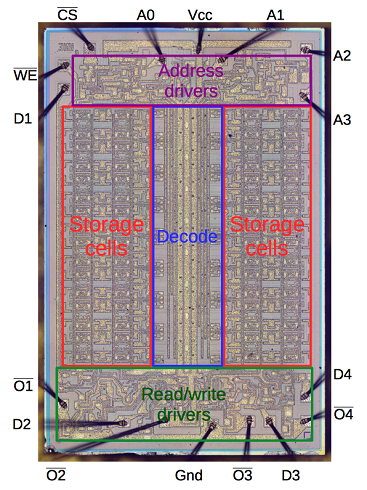 This article looks inside the 3101 chip and explains how it works. I received two 3101 chips from Evan Wasserman and used a microscope to take photos of the tiny silicon die inside.4 Around the outside of the die, sixteen black bond wires connect pads on the die to the chip’s external pins. 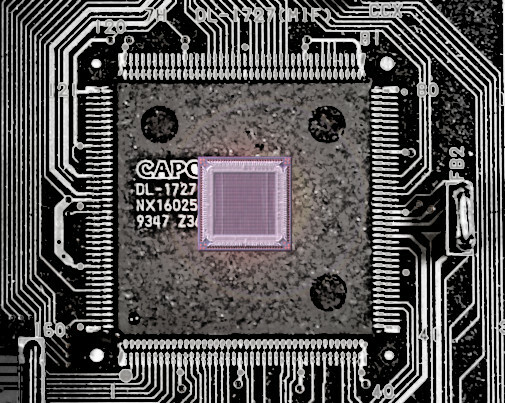 The die itself consists of silicon circuitry connected by a metal layer on top, which appears golden in the photo. The thick metal lines through the middle of the chip power the chip. See the full post and more details at Ken Shirriff’s blog. Remember the old video game Space Invaders? 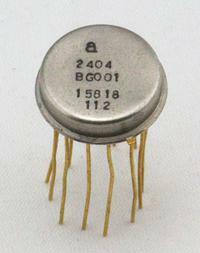 Some of its sound effects were provided by a chip called the 76477 Complex Sound Generation chip. While the sound effects1 produced by this 1978 chip seem primitive today, it was used in many video games, pinball games. But what’s inside this chip and how does it work internally? 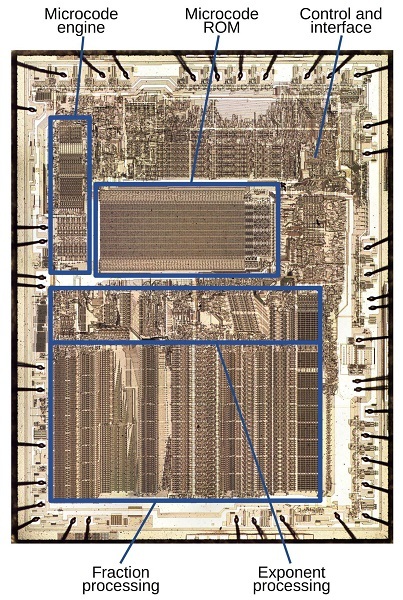 By reverse-engineering the chip from die photos, we can find out. (Photos courtesy of Sean Riddle.) 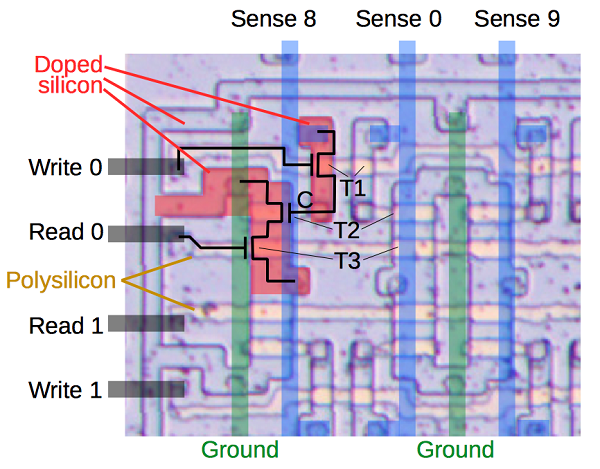 In this article, I explain how the analog circuits of this chip works and show how the hundreds of transistors on the silicon die form the circuits of this complex chip. The 74181 ALU (arithmetic/logic unit) chip powered many of the minicomputers of the 1970s: it provided fast 4-bit arithmetic and logic functions, and could be combined to handle larger words, making it a key part of many CPUs. But if you look at the chip more closely, there are a few mysteries. It implements addition, subtraction, and the Boolean functions you’d expect, but why does it provide several bizarre functions such as “A plus (A and not B)”? 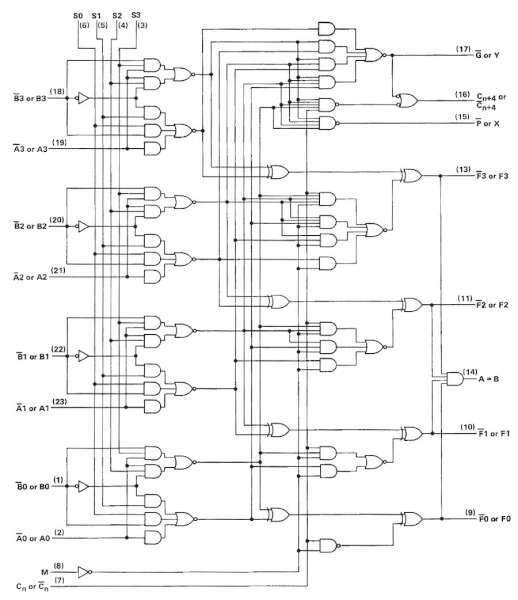 And if you look at the circuit diagram (below), why does it look like a random pile of gates rather than being built from standard full adder circuits. In this article, I explain that the 74181’s set of functions isn’t arbitrary but has a logical explanation. And I show how the 74181 implements carry lookahead for high speed, resulting in its complex gate structure. 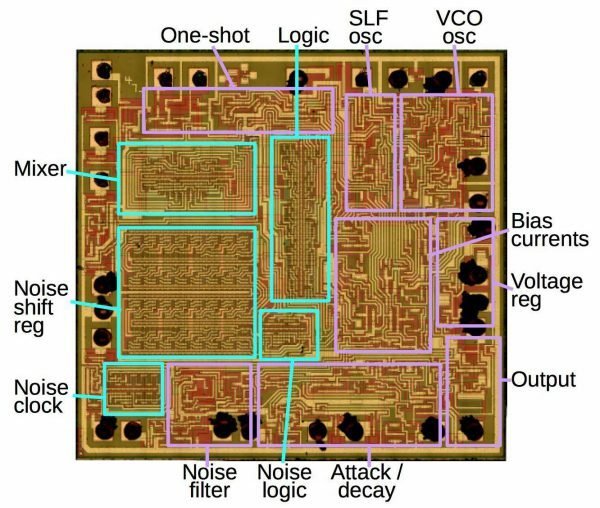 The revolutionary Intel 8008 microprocessor is 45 years old today (March 13, 2017), so I figured it’s time for a blog post on reverse-engineering its internal circuits. One of the interesting things about old computers is how they implemented things in unexpected ways, and the 8008 is no exception. Compared to modern architectures, one unusual feature of the 8008 is it had an on-chip stack for subroutine calls, rather than storing the stack in RAM. And instead of using normal binary counters for the stack, the 8008 saved a few gates by using shift-register counters that generated pseudo-random values. 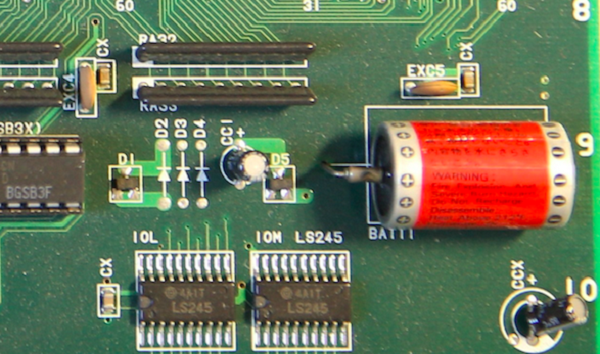 In this article, I reverse-engineer these circuits from die photos and explain how they work. More info at Ken Shirriff’s blog.